I wonder what makes a person not listen when you speak to them? Recently Dave and I met a salesman at an exhibition stand at The Good Food and Wine Show and we showed an interest in a specific product range. We explained to him that we would not be needing anything for at least a year, but he asked for our details none the less. When I gave him my phone number I explained that he did not need to call us. He promised that he was only taking our number for his data base and that he would put us on the system and when we went in to the store he would give us a discount. Not a week afterwards he called and asked me if he could send me the quotation on the items we had looked at. I explained nicely and politely that there was no point, as we would not be needing them for a year – and who knows what will be available then. He went on to inquire about our other needs and I told him that there was nothing else we needed right now. I asked that he not call me and I promised we would go in to the store, and ask for him, when we are ready to start buying kitchen appliances. One week later and I got another call. He clearly did not listen the first two times to my please don’t call me request. I sincerely hope he listens to my third request, but guaranteed, we will not be dealing with him when we eventually do go in to choose our hob and oven. When I am frustrated like this, I love to cook something that needs a little bit of my concentration, and that will simmer nicely on the stove, while I simmer with a glass of wine! What do you cook when you need to get rid of frustrations? Osso Bucco is one of my favorite cold weather dishes. If the salesman called me, the third time I would explain that I might buy from his store but that I would make sure I didn’t buy from him because he didn’t respect my wishes. But of course, I’m probably not as kind as you are. I hate pushy people like that! I love Osso Bucco! I wonder when my blog will move, I don’t post there anymore, but would like to import those posts to my current blog, which I have been unable to do so far. it’s the same with estate agents, they bug you forever. that is the truth! Why can’t they take NO for an answer? I’m coming to your house on a day when you want to cook away the frustration!! So good to be here. For some reason, I’ve had a tough time accessing your blog over the past couple of weeks! The problem with pushy sales people is they don’t seem to realise that they’re doing themselves a disservice with being so pushy! Lovely recipe, Tandy! Would be perfect for this cold weather we’re having.. I met a saleswoman like this.. call after call, in the end I never called her back. I wonder if she got the hint? 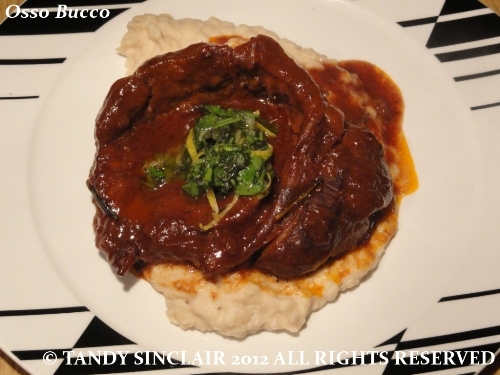 I love osso bucco.. thanks for the great recipe! Hi Tandy – I don’t think I got carried over with your move – I have been missing out on all of your posts! I have just resubscribed now! I tend to have experiences like this with personal trainers at my gym. NO I don’t them to pester me every five minutes trying to get me to make an appointment with them! Sheesh! Hope he stops pestering you soon! Wow! I’ve never had this before but I’d really love to try it! Love the combination of tomato, wine and beef!! mmm! Must be really tasty! That looks good – perfect comfort food and a good way of destressing from pushy sales people!